Posting on social media sites, sending out e-newsletters, creating videos, and blogging are some of the preferred content marketing tactics among companies. However, one tool that is often overlooked is the webinar. According to the Content Marketing Institute’s 2015 B2C Content Marketing survey, 93 percent of marketers utilize social media content, 80 percent use e-newsletters, 74 percent produce videos, and 67 percent blog. Only 31 percent hold webinars or webcasts. The opportunity to connect with customers on a personal basis. It gives your faceless company a face and personality. The chance to educate your customers. Content marketing is all about informing your customers, and a webinar gives you the platform to do this in a visual manner. The means to find and generate qualified leads. You can require users to submit their email address and basic information to access your webinar. In the sign-up form, you might ask what kinds of content they want to see, if they’d like to sign up for company updates and your email newsletter, and why they’re joining the webinar in the first place. The platform to conduct sales. You can use a webinar to sell your product by showing your customers how it works, answering questions about it, and giving them exclusive discounts on it if they watch the live feed. If you want to start your own webinar, the following are some guidelines to take into consideration. 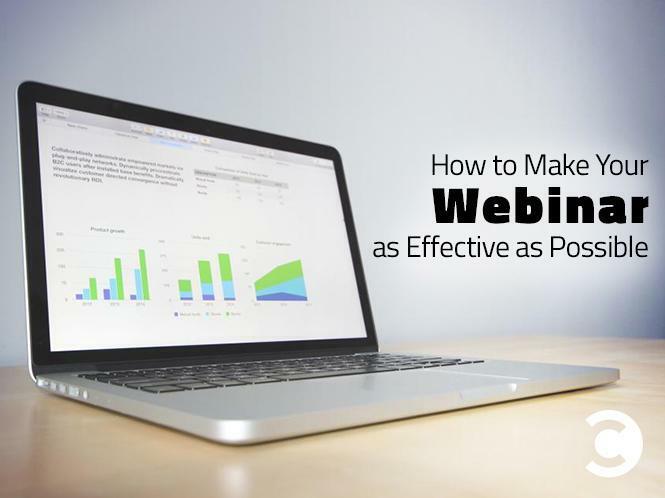 Assuming you’re utilizing a webinar for B2C marketing purposes, you’ll want to invite customers and potential customers that the webinar will actually appeal to. You segment your email subscribers, so you need to segment your possible webinar attendee list as well. For starters, look over that data you collected about your groups of subscribers on your email list, social media pages, and website. Send the invite to the people that will tune in for the topic of discussion. Consider your customers’ locations and lifestyles: If you’re a clothing company promoting a new brand of women’s active wear, you might invite your customers who are stay-at-home mothers. You’d then hold the webinar at a time when they’re able to be in front of their computers to watch. Are you trying to target business professionals? Hold the webinar on their lunch break. If you’re looking to collect leads, promote your webinar on blogs and websites that your desired customers visit. Take out ads on social media sites that they use. If you’re hoping to strengthen existing customer relationships, invite customers who have bought a product from you once or a few times and left good reviews on your website. Overall, the goals you have in mind for your webinar will dictate whom you should invite. You can host a webinar to push your products, show your customers that you’re leaders in your industry, demonstrate unique information to your audience, or find new customers. In your webinar, you’ll want to present content that your audience can’t find elsewhere. This may mean bringing in interesting guest speakers for a one-time interview and lecture, hosting a one-on-one with your busy CEO, giving customers promotional codes they can use for a limited time when making purchases, or revealing company or product news that’s never been divulged before. You should also produce content that is highly visual and engaging. While discounts and other benefits for the people who watch live can be timely, the rest of the webinar should contain evergreen content that can be watched at any point. After all, TiVo and DVRs are popular for a reason. Most people prefer to watch video content on their own time, since it requires their full attention. A webinar can be the start of a full-on content marketing campaign. It has the potential to spark follow-up blog posts, email newsletters, individual clips for YouTube or Facebook video, hashtags, Facebook posts, photos for Instagram, and infographics. You can post about the information taught in the webinar, including questions that were answered, who tuned in, and what the overall experience was like. You can blog about what you offered during the webinar, and what you’ll be giving away during the following webinar. If you post photos from it and create your own hashtags, you’ll make the people who tuned in feel like they were in an exclusive club and part of something. Your post-webinar content can entice people to tune in next time if they see how much they missed out on. It can also keep your webinar going long after it’s over.